Every time I drove by the entrance to Box Canyon Falls, I was a bit puzzled. The entrance was off the main road and went over a small canyon, yet every time I looked into that canyon I saw very little water. I can’t imagine a raging waterfall coming out of here. However, we all know how things aren’t as they appear and I became more curious each time I passed the sign. One of my hiking books recommended Box Canyon Falls and noted a high bridge to walk over. Ok, now I have to go visit the falls and find out what’s really in there. Box Canyon Falls is located in Ouray, Colorado off Camp Bird Road. As you leave Ouray heading to Silverton, the main road curves left and Camp Bird Road will be on your right. The entrance to Box Canyon Falls is just a block after you turn off the main road and easily accessible by car. As I made the turn into the Box Canyon Falls entrance, I quickly realized I was heading somewhere different than where that other, dry canyon led. After paying the small $4 entrance fee, getting the scoop on what to see and the ever important map, I was off! There are a couple of trails, but I took the left one and headed up for the bridge. Notice I said up…..the trail begins as a long set of stairs. No problem, I’ve been camping at 8,000 feet for a week, these stairs should be easy. Fortunately there is a covered observation tower where the stairs end and the dirt trail begins. It’s perfect for rehydrating, taking in the view of Ouray, meeting other travelers and catching your breath. The trail becomes more mountainous at this point and continues its ascent, but it’s not long before the familiar sound of rushing water can be heard. At the top is the famous bridge that traverses the deep canyon. This bridge is perfectly solid, but constructed of metal grate material which means you can see the canyon below your feet. Needless to say, walking on bridge that I could see through was a little disconcerting at times. I don’t mind heights as long as I’m on something solid, like a mountain. Once on the bridge, the fears fade as you soak up the amazing views. To the left are the majestic mountains and deep canyon where the falls originate and to the right is a panoramic view of Ouray. 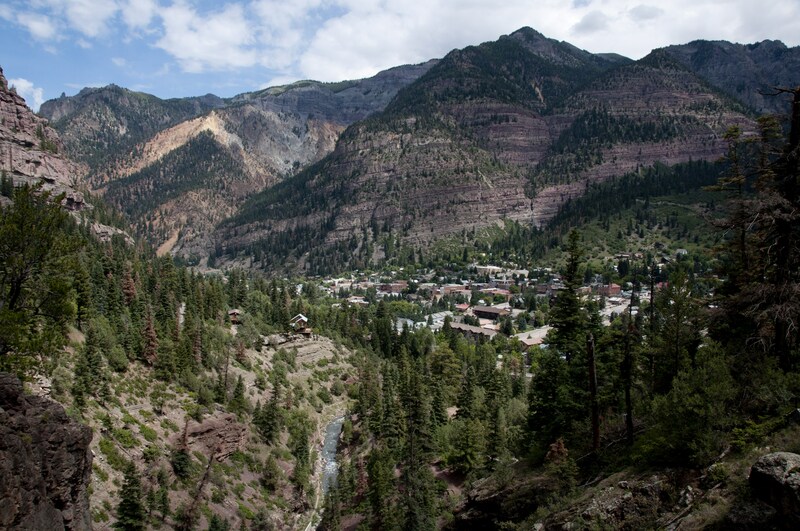 While looking at Ouray, take a close look at the mountain a little bit to the right of the town. It’s easier to do with a zoom lens, but you can see Cascade Falls from here. After the bridge and through a tunnel the trail turns into the Ouray Perimeter Trail which will take you to the visitor center. I couldn’t resist the tunnel so I walked through and then turned around to head back to the base of the falls. As I was descending, I was amazed at how scenic it was and how I’d driven past so many times earlier. I’m glad I read that hiking book, now if I could only remember the title. 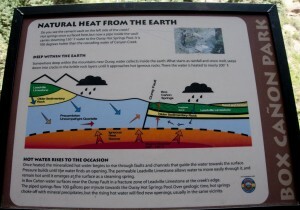 Going to the base of the falls was much easier than the trek to the top and informational placards along the way provided interesting facts. 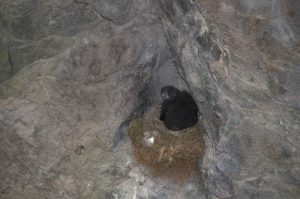 For me, the coolest sighting was of a baby Black Swift. The Black Swift is a bird that can’t perch on a branch or wire, but can only cling to vertical surfaces. 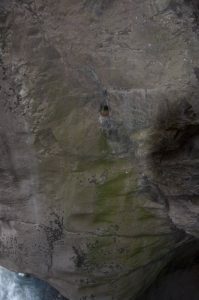 The nests are often built near waterfalls and very high so they’re difficult to see from the ground. As you can see in the picture sequence, this little guy’s first flight off that ledge is going to be memorable. I guess being that high up, he’ll have plenty of time to perfect his flying before getting close to the ground. Continuing down the stairs, you end up in the narrow canyon part of the falls. You can’t walk to the base of the falls, but you can see the narrow falls thunder between two massive rock walls and then flow out into Ouray. The cool, misty air was a refreshing change from the hot summer sun. 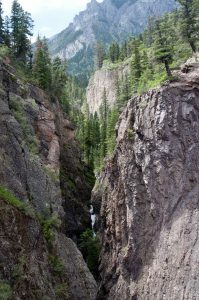 In addition to the Box Canyon Falls trails, there is short nature trail, a trail into town and the popular Ouray Perimeter Trail. Whether you hike in via the Perimeter Trail or drive, it’s definitely a must see when you’re in Ouray. You’ve just made my BL a little bit longer.